Cam Oliver dunks throws down a dunk on Monday against the Wizards. LAS VEGAS – Cameron Oliver has a mental hit list. "Sixty draft picks that went before me, that's my hit list," said the power forward, who went undrafted out of Nevada last summer. "Whoever got drafted this year, that's 120. So I got a hit list." The Oakland native is playing with an edge as a 76er in the NBA Summer League. In the process, the chiseled 6-foot-8, 225-pounder is showing that there might be a place for him in the league as high-energy guy. Oliver, who turned 22 on Wednesday, is the Sixers' second-leading scorer at 10.5 points per game. He's also averaging seven rebounds, two steals and one block. And he's been one of the most athletic player here. His dunks have been straight out of a highlight reel. "He has an NBA body," Young said. "I haven't seen every [summer league] game. But I watched a lot of them. "He has to be one of the most athletic guys here, but with his body. He's like a man, and he's big and strong with that athleticism. He's got a bright upside." However, Oliver needs to hone his skills to make an NBA roster. Oliver played last season for the Delaware Blue Coats of the NBA G-League, and needs to specialize on rolling to the basket and grabbing rebounds — especially offensive boards. The versatile player needs to show that he's able to switch off and guard both the perimeter and low post if need be on defense. Young challenged him during Wednesday's practice to be more balanced when he gets in the paint. 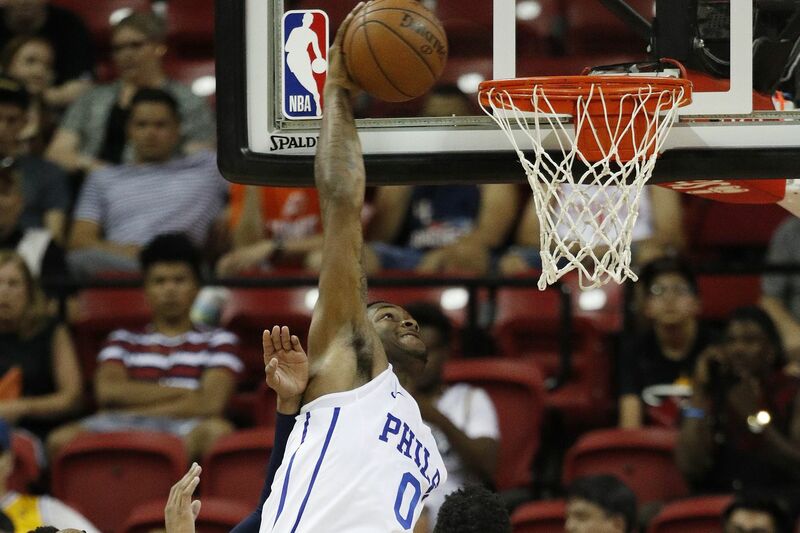 The Sixers want him "to get in there and be strong with it," Young said, "and find a way to get to the free-throw line and not go in there and miss easy stuff around the rim without getting foul." Back in college, Oliver was a beast. Then a center, he had one of the best freshman campaigns in Nevada history during the 2015-16 season, leading the team in scoring (13.4 points), rebounds (9.1) and blocks (2.6). He ranked second in shooting at 50.8 percent and was named the Mountain West freshman of the year. Oliver followed up his freshman year by averaging 16 points, 8.7 rebounds and 2.6 blocks as a sophomore. He finished that season with the school's career blocked-shot record (190). Oliver also had 1,071 career points, becoming just the ninth player overall and fifth sophomore to hit the 1,000-point milestone. Looking to fulfill a dream, Oliver entered the NBA draft after his sophomore season. After going undrafted, he signed a multiyear deal with the Houston Rockets. However, the team waived him on Oct. 15. He signed with the G-League's Wisconsin Herd on Nov. 19 and was traded to Blue Coats on Jan. 26. Being in the G-League made his desire to play in the NBA stronger. "At times, I was playing against players that were getting call-ups," Oliver said. "Seeing that and seeing that I actually played against them, not trying to diss anybody, but I deserve to be there." Knowing what he now knows, Oliver feels like he blew his opportunity with the Rockets. However, he says that's in the past now. These days, he's just playing with purpose. "I have a chip on my shoulder," Oliver said. "That being from the city that I'm from, and actually going undrafted, too."